In only three days Prague has managed to become one of my favorite cities, with its beautiful architecture, rich history, and plethora of things to do. 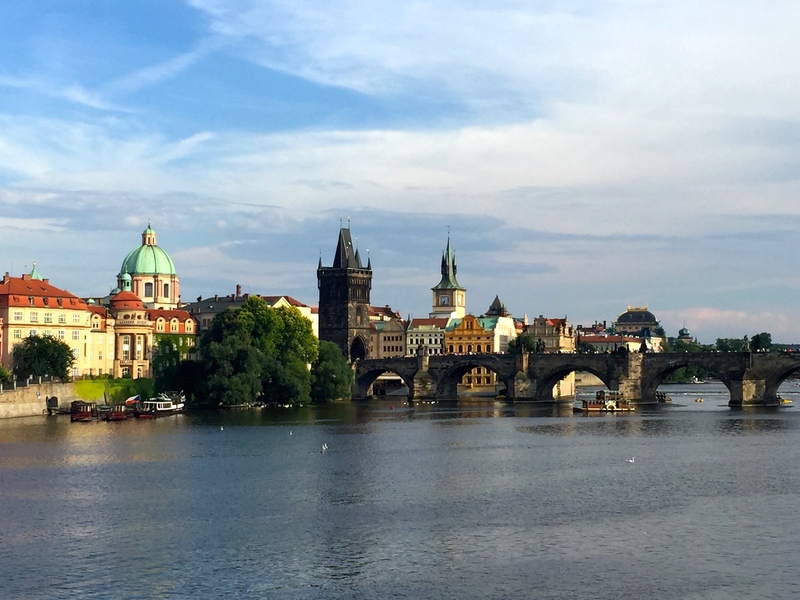 While in the Czech Republic I focused on many historical aspects of Prague and surrounding towns, especially in relation to World War II history. 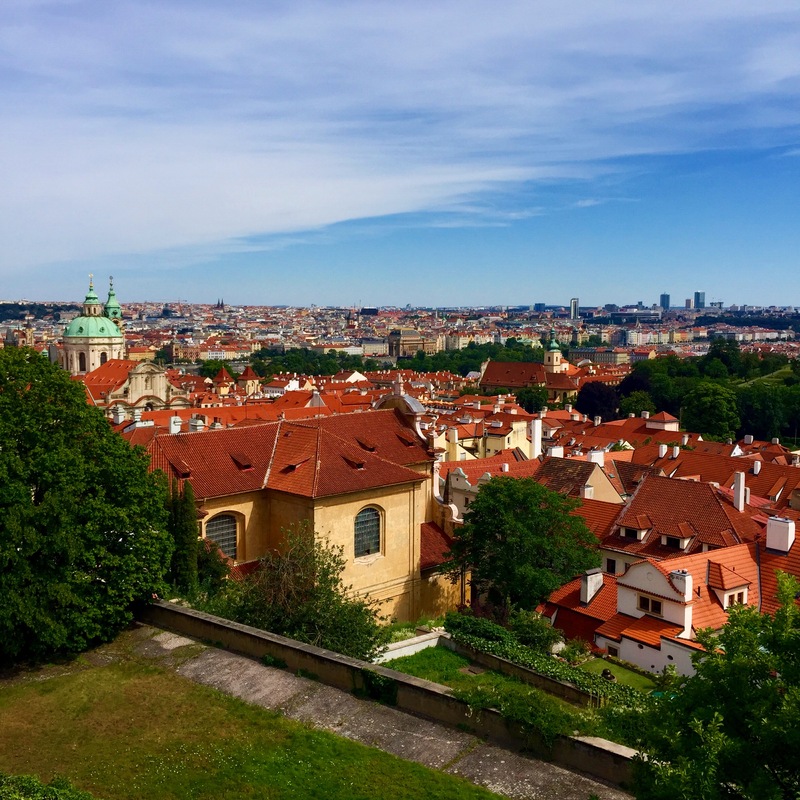 Because of this, I was able to take part in tours that showed off some famous Prague attractions, which helped me see some of the city’s most beloved attractions. 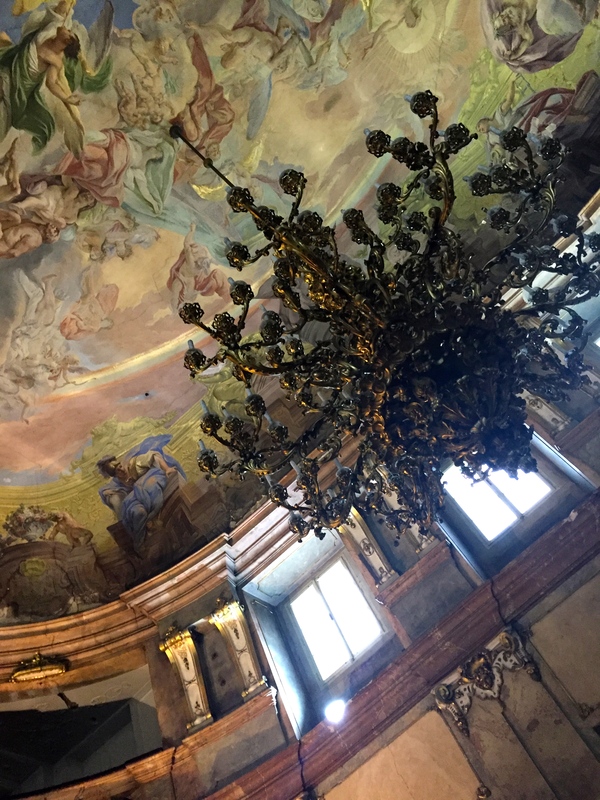 Although there are many places and activities to do in Prague, below is a list of thirteen of my favorite attractions, ones that made the city so magnificent for me. On the first day in Prague I was able to check out Prague Castle. I will admit that I wish I had time to go back, as I was already up for 24 hours straight by the time I toured the castle, which makes me doubt I was coherent enough to fully appreciate its grandeur. During the first part of the tour we saw St. Vitus Cathedral, which was gorgeous. I’m a fan of stained glass and the stained glass in the St. Vitus Cathedral was ornate and fantastic, especially one window in particular that was not only so vivid, but very detailed as well. The castle also has two guards who change each hour, similar to Buckingham Palace. We were not present for the changing, but our tour guide said it was very interesting to see. The palace is huge, the largest ancient castle in the world, and while we were only able to see a small part of it, it was still amazing. Here we were also able to see some views of Prague which was also amazing to see. I wish we had more time, and would recommend it on a trip to Prague if only because I want to see what more it has to offer! 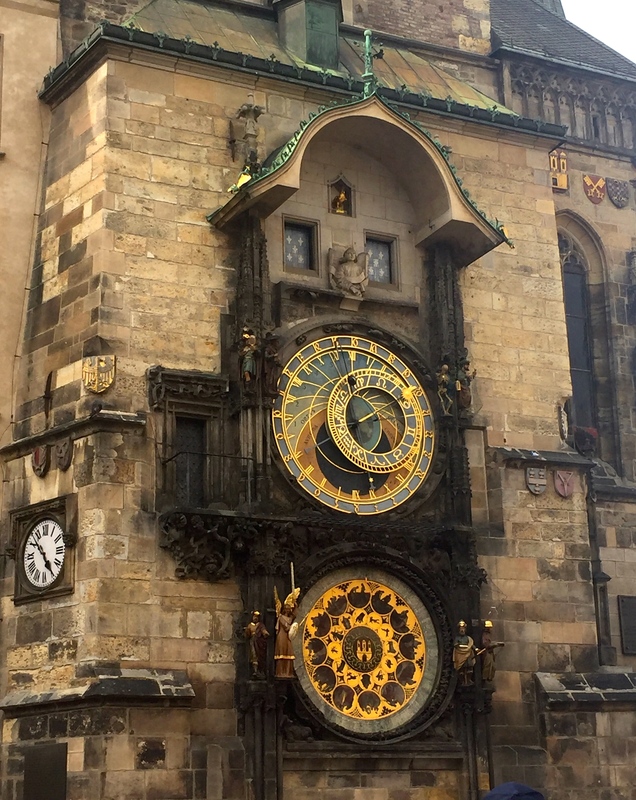 One of the most famous tourist attractions of Prague is the Astrological Clock in Old Town Square. Every hour during the day the clock chimes and has apostles that ‘bless’ on-lookers, coming out of the clock and rotating around. Tourists crowd the clock to see this, smartphones ready to take video, not wanting to miss the activity on the hour. While I think the clock was absolutely gorgeous, I was disappointed by the apostles and in whole the clock’s hour chiming. It was interesting to see it because it was so hyped up, but I don’t exactly know why it is so praised – if I were in Old Town on the hour I think it is something interesting to check out, but I didn’t think it was worth the trip for the short show alone. The clock itself is absolutely stunning however, and should not be missed. Although not necessarily in Prague, my group went on a tour of Reinhard Heydrich’s assassination, which included the village of Lidice completely destroyed by the Nazis. As someone interested in history I definitely would recommend the tour, if only to gain a greater appreciation for the struggles the Czech people had during World War Two, but if not interested in Czech or World War Two history I recommend skipping the tour. Read more about the tour and the history surrounding Reinhard Heydrich’s assassination and Lidice’s destruction here. The Klementinum Library is absolutely exquisite. The entire library has seven million books in collection, the building has two churches, two chapels, and seven courtyards, and it is overall fantastic. What I found disappointing about the library however was the fact that even on a tour you are unable to go in the library itself. Considered one of the most beautiful libraries in the world, you are able to peer in, but are not allowed entrance as the room is temperature controlled, and photography is strictly forbidden. The books were stunning from what I was able to see, and they have a collection of historical globes, one of which doesn’t even include Australia, as it hadn’t been discovered yet at the time of the globe’s creation. We were also able to go up to the top of the library, climbing up many flights of stairs to see the city spread out. This was one of my favorite ways to see Prague because it was close enough to distinguish certain buildings, while still being above everything. 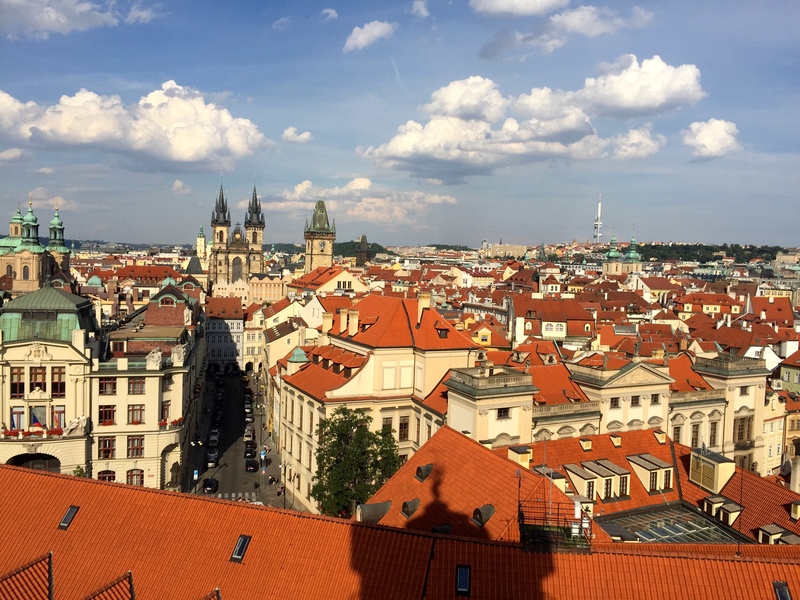 If interested in libraries, history, or seeing from the top of a tall building, then I would recommend the Klemtinum tour, but if not there were other more interactive activities to do in Prague. Old Town in Prague was beautiful as well, and one of the areas of town I would most highly recommend. In general I enjoy older and more classic looking towns, and Old Town in Prague has that vibe. Pretty much every façade of every building in Old Town blew me away, very elaborate and colorful, at times with elaborate statues as well. While in Old Town my friends and I were able to observe Our Lady Before Tyn, an exquisite church and just hang out and relax. 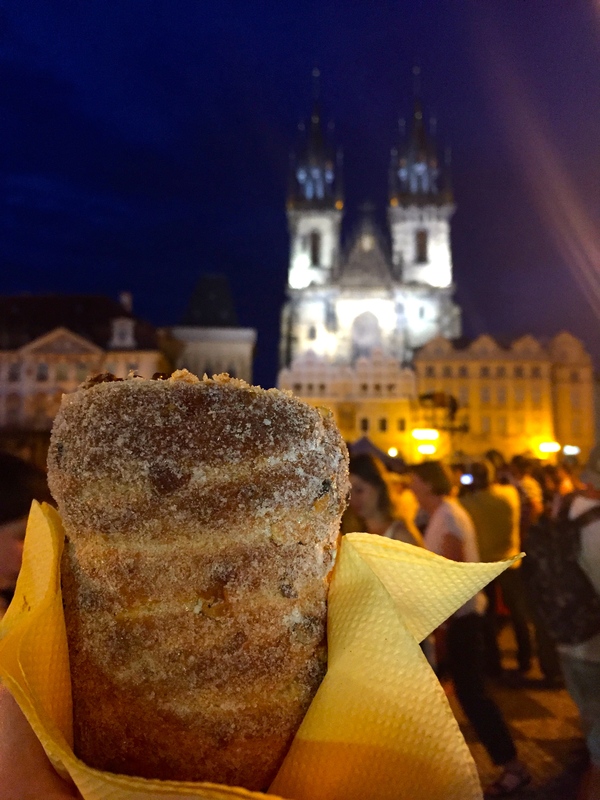 We also decided to have a classic Prague tredelnik, which is rolled dough with a sugar and a walnut mix topped on it. I had a few during the time in Prague, once with Nutella inside, and another with ice-cream, both of which I would recommend. What I also found fun was that while we were there the jazz musician Charles Lloyd was performing a concert which we were able to watch which we ate and enjoyed the beauty of Old Town. 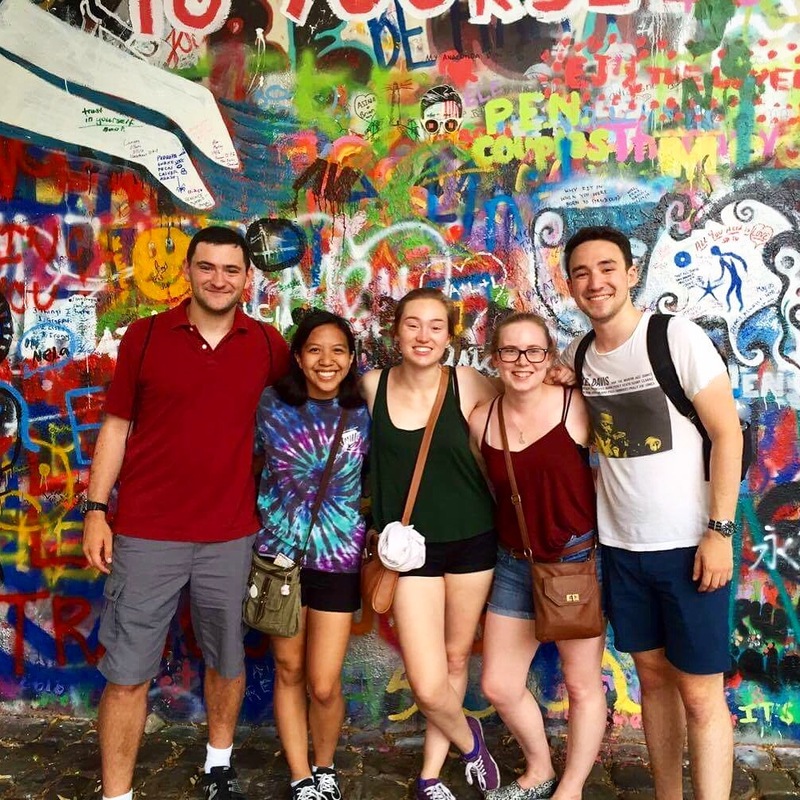 An off the beaten path attraction near the Charles Bridge is the Lennon Wall (not to be confused with Lenin). The Lennon Wall is a wall that has been spray painted over and over again, initially featuring inspirational quotes and images relating to the Beatles. It was very colorful and fun to attempt to find, as my friends and I got lost multiple times trying to find it, resulting in an interesting exploration of the streets of Prague. The wall itself is also exciting, full of color and a great place to take pictures. I myself am not the biggest Beatles fan, but even I could enjoy this part of Prague. Trying to find the Lennon Wall when in Prague is definitely an adventure worth having. 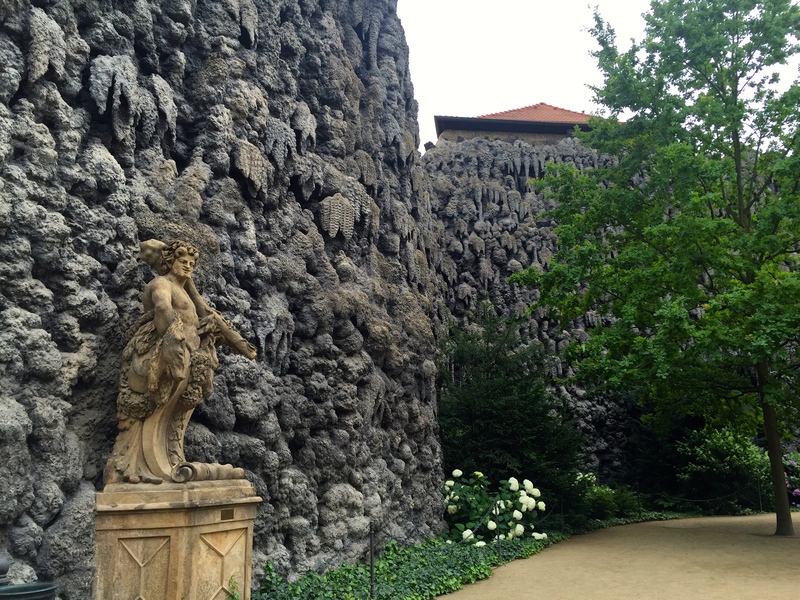 In Wallenstein Palace’s there is a grotto interesting to check out. What is most fascinating is the Dripstone Wall, a wall standing in stark contrast to the garden surrounding it. The grotto wall is a collection of black-gray rocks that are seemingly melting. There is also a garden area with peacocks walking around which was gorgeous, and an area to check out the Palace building which I didn’t explore as much, but still a nice break away from the crowded city. While not one of the top things I saw on my trip I think the grotto was a nice change of pace and beautiful in an eerily grotesque way. For someone interested in Czech history, especially the country’s relation to Communism, Jan Palach’s grave could be of interest. 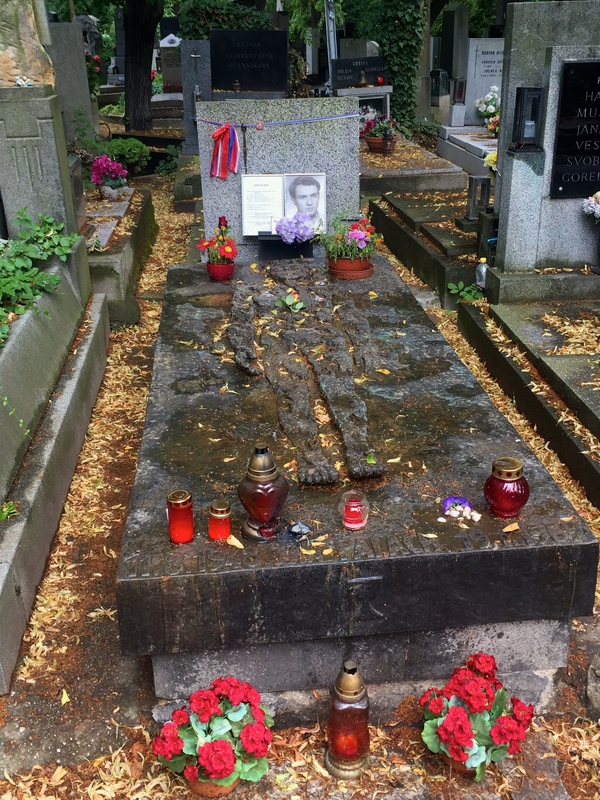 Palach was the student who set himself on fire in protest of Communism in 1969, and his grave pays tribute to him and his protest, which years later helped impact the Velvet Revolution of 1989 that ended Communism in Czechoslovakia. 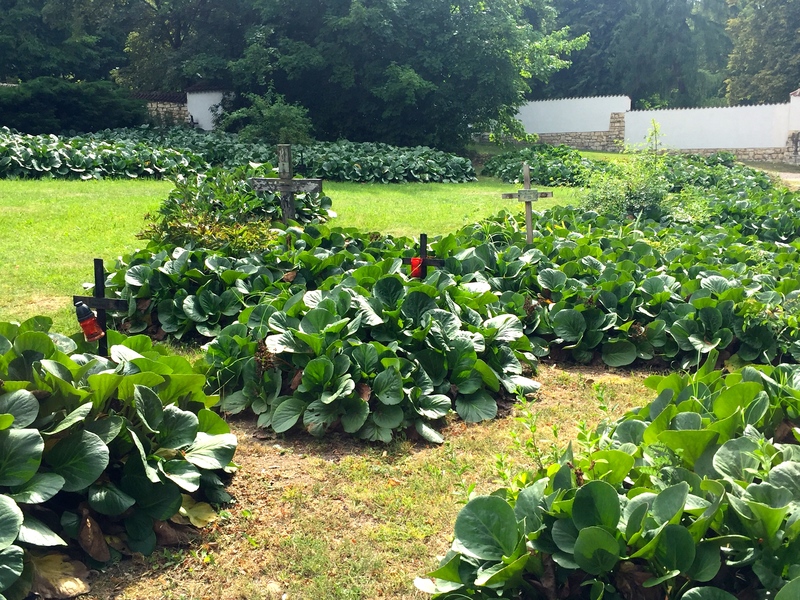 Our hotel was right next to the cemetery, which made it an easy stop for us, but I would recommend it for those with an interest in history. I find cemeteries to be absolutely gorgeous, which makes me recommend it doubly. For those staying closer to the city hub it might be too far away (around five stops on the green line) for it to be worth the trip, but for those near Flora’s metro stop it’s definitely worth popping by. The Jewish Quarter in Prague is a must see. To get in you have three options, the second being the option that provided us the opportunity to see most of the attractions while still being relatively cost efficient. To start, we walked through Pinkas Synagogue, which was beautiful. The synagogue has the names of Jews murdered in the Holocaust written on the walls, organized by the town the people were removed from. This synagogue was absolutely stunning on its own, and would have been worth the cost of admission by itself. After the Pinkas Synagogue we then walked through the Old Jewish Cemetery, which was amazing. Being a fan of cemeteries I found it beautiful, and the graves were so old and extraordinary. Following the Old Jewish Cemetery we looked around the Ceremonial Hall which housed artifacts such as very elaborate paintings, things used in religious ceremonies, and old texts. This part wasn’t necessarily my favorite, but I felt as though it helped enhance the experience of the day. The next thing we saw in the Jewish Quarter was the Spanish Synagogue, which is considered one of the most beautiful synagogues in Europe. I can 100% believe that claim, as it was one of the most stunning buildings I have ever been in. The entire synagogue is a mosaic, and is breathtaking. The organ is completely visible as well, and there were some display cases showing off some more Jewish ceremonial artifacts which was amazing. This was my favorite part of the tour by far, and was completely blown away. 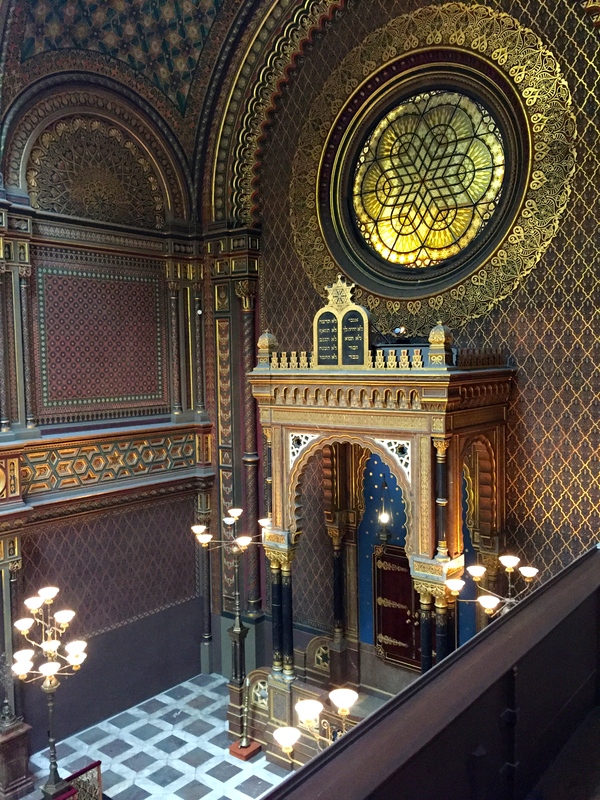 The Jewish Quarter as a whole is a must see, but the Spanish Synagogue should not be skipped. Much like the astrological clock, the statues dedicated to Franz Kafka are nice to see, but only if you are already in the area. Kafka, author of ‘Metamorphosis,’ is one of the Czech Republic’s most famous writers, and is thus remembered by the city. The statues themselves are interesting. 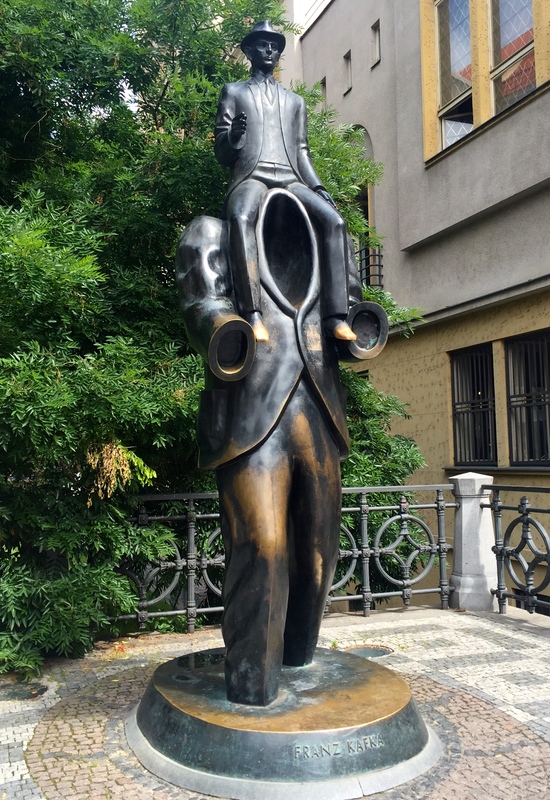 The first, near the Jewish Quarter, features a man without a head with a smaller individual on his shoulders, and in the Quadrio shopping center there is what is referred to as the ‘rotating head’ of Kafka, a sculpture of layered mirror metal forming the shape of a head. While each of the statues were cool and unique, unless you were very interested in Kafka in particular I don’t think either is worth making an individual trip to see, but are worth searching out if you are generally close. The views of Prague are absolutely stunning, in part because Prague is such a beautiful city. One of the better views of Prague I was able to check out while visiting was the view from the Petrin Lookout Tower, the Eiffel Tower looking building on the top of Petrin Hill. To get to the top there are two options: climb, or take the tram. My friends and I decided to climb to the top, and while I felt like I was going to die a few times due to shortness of breath, the way up had many lookout points where you could take pictures of the city, in addition to being fantastic exercise. Figuring out which path to take to get to the top was slightly challenging, and at times I fel t as though we were doing some unnecessary walking when we realized we had taken the wrong path, but it was manageable. 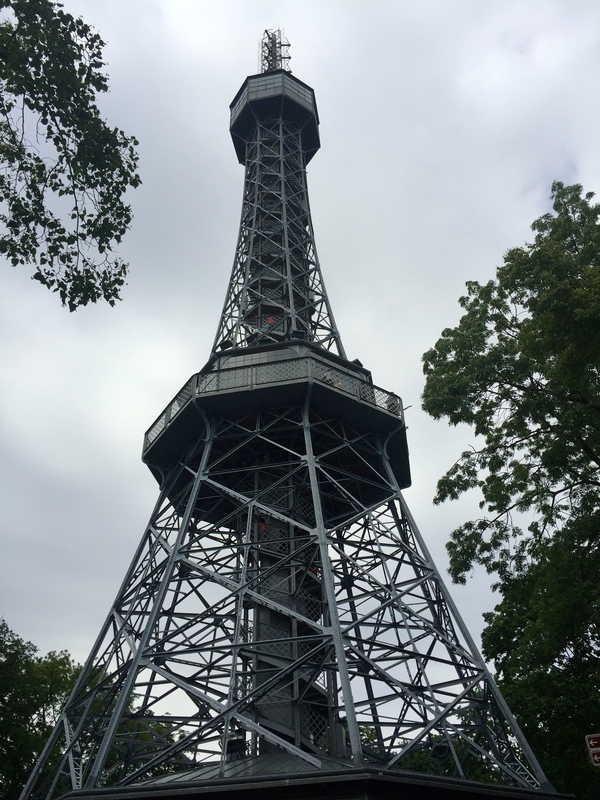 When at the top of the hill you come to the base of the Petrin Lookout Tower. To get to the top you have to walk 300 steps up, or pay the fare for the elevator. Although I was exhausted I am glad I choose to walk up, as halfway up there is a lookout section where you could take pictures which I actually preferred to the absolute top, as at the top there are windows surrounding the structure, and I believe that the lack of windows leads to better pictures. I would definitely recommend going to the Petrin Hill for people who want to see a bird’s eye view of Prague. A special event two of my friends and I attended while in Prague was the Royal Czech Orchestra at Palace Colloredo-Mansfeld, a location where Mozart himself played. The orchestra was amazing, with two violinists, a viola, and two cellos, featuring a soprano, violinist and cello player for certain numbers. What I found particularly interesting was the location. I had assumed it would be a typical theater, maybe a tad smaller. Instead, we were sitting in a large room. The room looks similar to what I imagine 19th century balls being held in, very open with a high ceiling, giant mirrors on either side, and an amazing fresco on the ceiling. While I was at first worried that this smaller room meant the concert was going to be lackluster, I think it rather made the entire performance feel more intimate. If looking for a show to see while in Prague, I would highly recommend the Royal Czech Orchestra, or truly anything at the Palace Colloredo-Mansfeld. Charles Bridge is one of the highlights of Prague, as well as being one of the busiest parts of Prague. The bridge is gorgeous, featuring ornate statues, and it is where you can buy touristy paintings and other souvenirs. On my last night I was able to see sunset on the bridge, which was absolutely gorgeous, but in general I enjoyed looking at the bridge from farther away. I think the Charles Bridge is beautiful, and thus taking pictures of Prague with the bridge in the picture beats taking pictures of Prague from the bridge. To get the best experience, I would recommend checking out the bridge either in the late afternoon or early evening as opposed to in the middle of the day, as the bridge can get quite populated. Definitely a must see when visiting Prague. This entry was posted in Europe, History, Travel and tagged czech-republic, history, prague, prague-attractions, prague-czech-republic. Bookmark the permalink.